John Nicolson (1843-1934) was a Caithness farmer with a talent for painting and sculpture as well as a deep interest in local history. 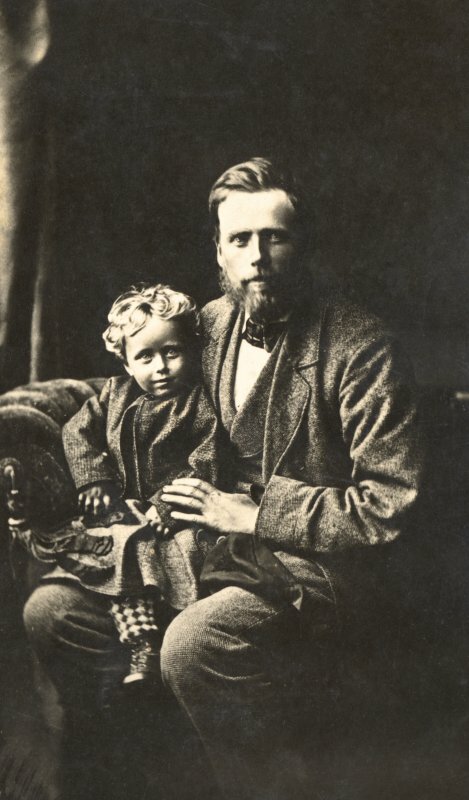 He was born at Stemster near John O' Groats in 1843, but moved in 1858 to Half Way House at Auckengill, (now Summerbank) where he continued to farm until his death in 1934. 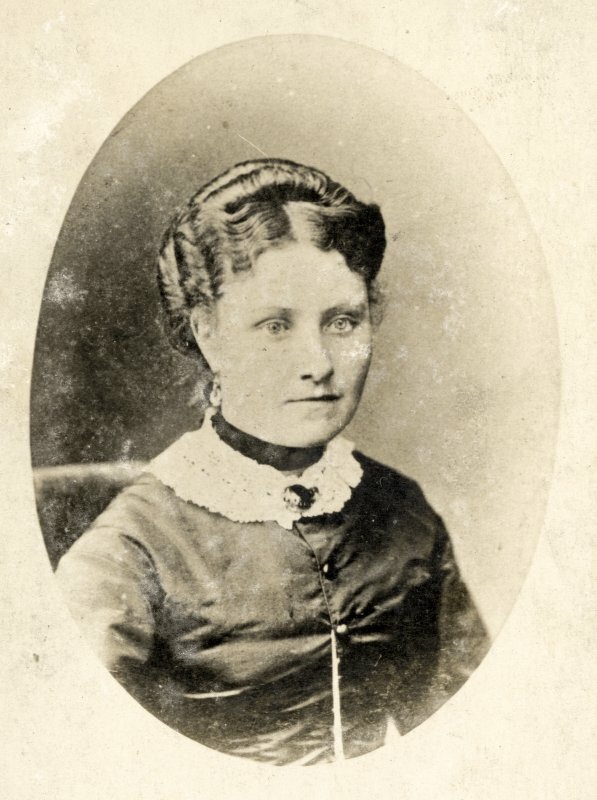 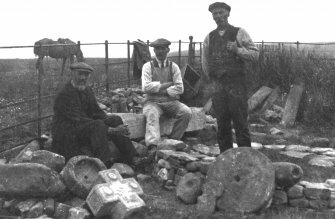 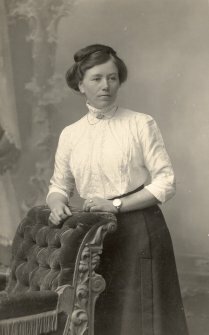 Nicolson's interest and knowledge in the history of Caithness was such that he was regularly approached for information on its archaeology, and by people researching family histories. 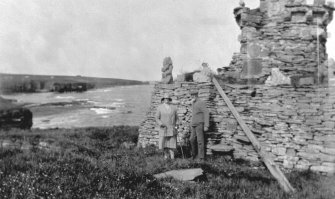 He was approached by RCAHMS Secretary Alexander O Curle in 1909 during the survey of ancient monuments in Caithness, for which he supplied plans that were published in the inventory two years later. 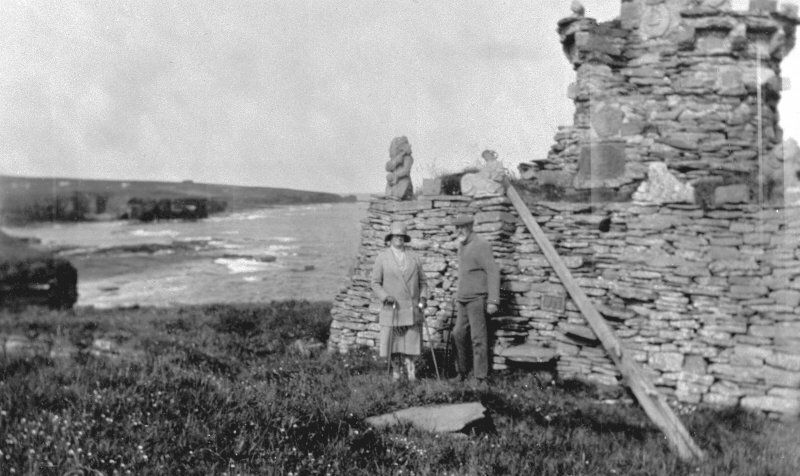 John Nicolson played an important role in Sir Francis Tress Barry's archaeological investigations of Caithness. 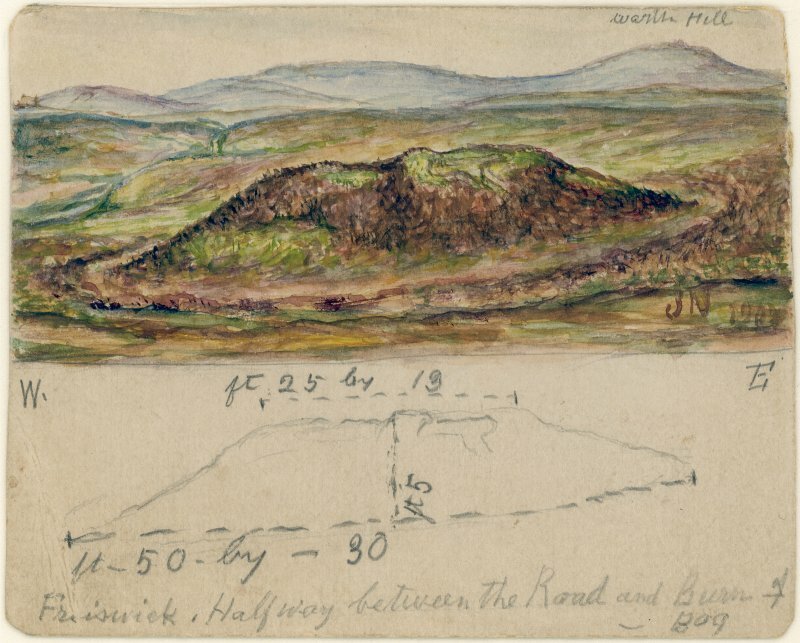 Nicolson acted as Barry's foreman, supervising the excavations and using his artistic talents to illustrate the archaeological sites they investigated and the finds they recovered. Together Barry and Nicolson excavated around twenty five sites in Caithness. 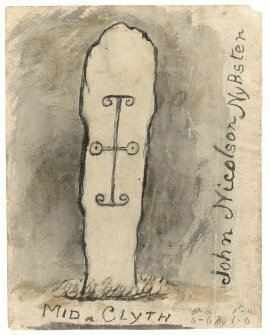 Nicolson played an important role in creating visual records of the sites and of the items found. The John Nicolson Collection is therefore significant archaeologically and integral to our understanding of the early history of the region and the work they carried out. 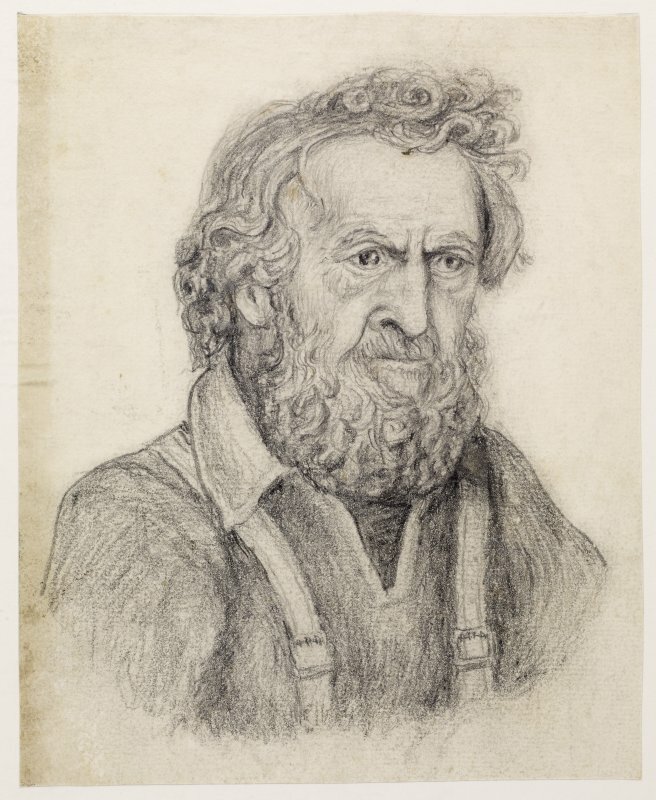 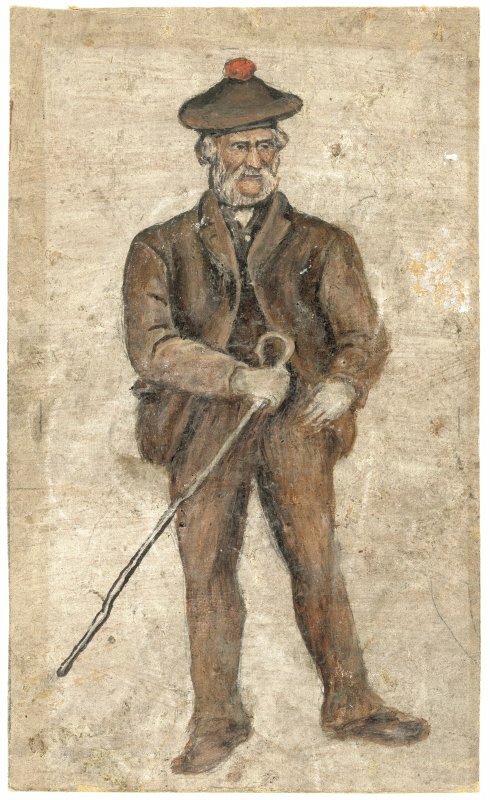 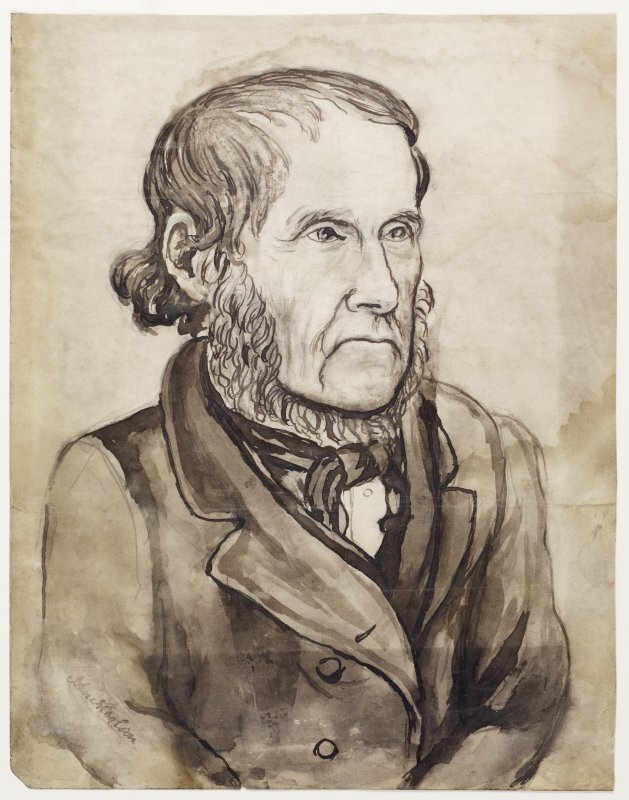 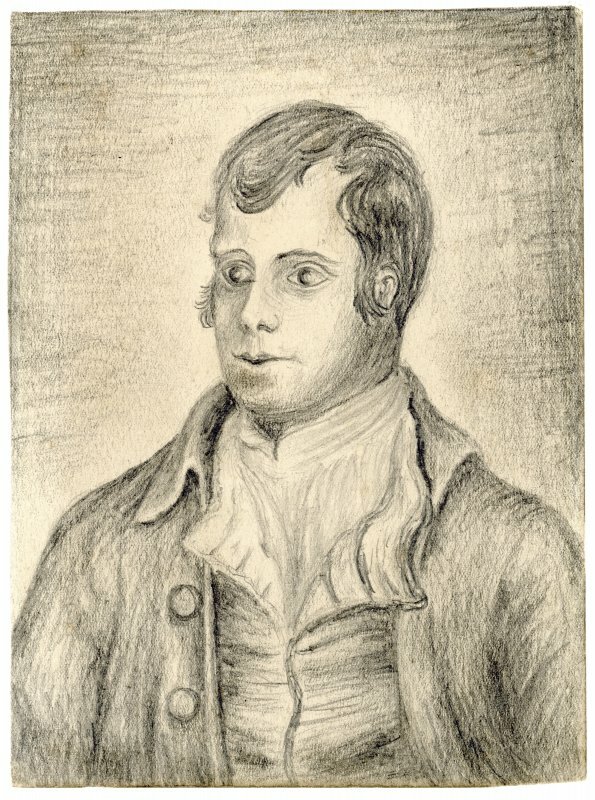 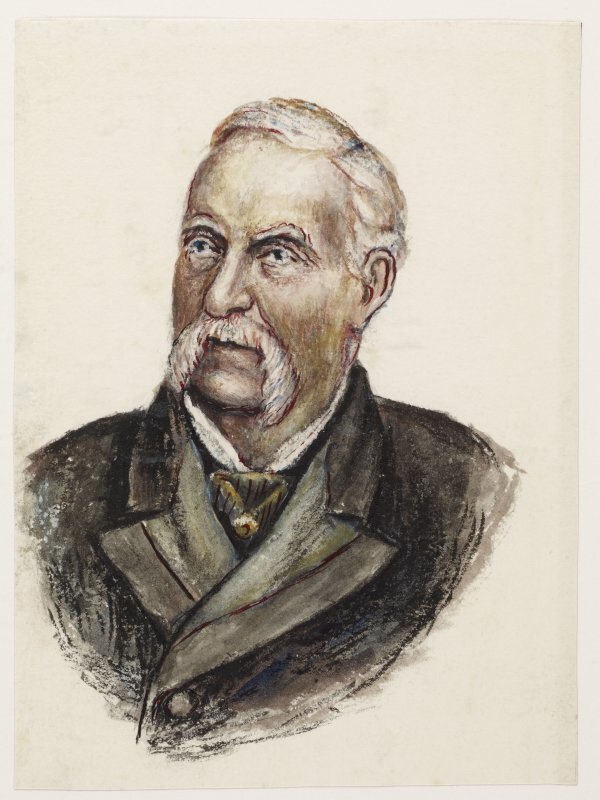 As well as archaeological drawings, John Nicolson, a self taught artist, sketched and painted many portraits of local people, and also the landscapes of Caithness. 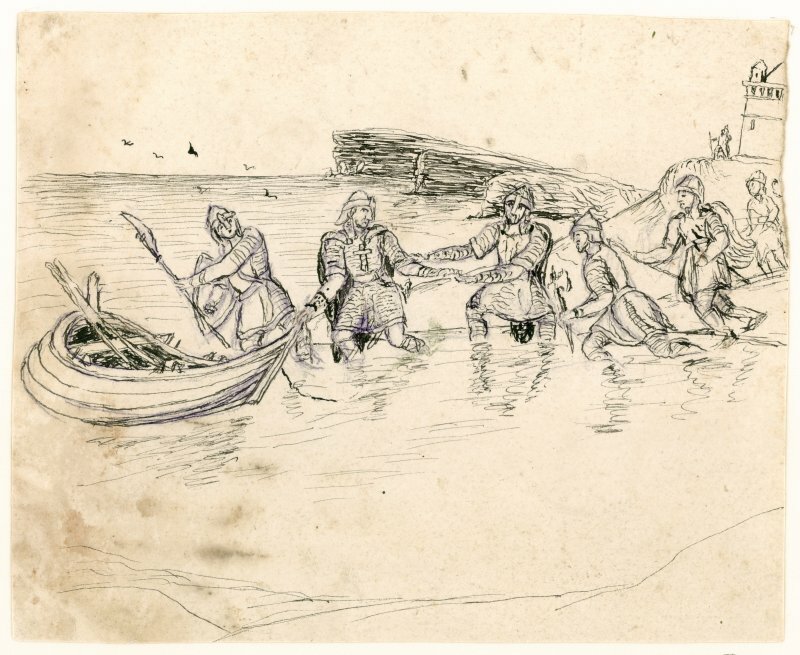 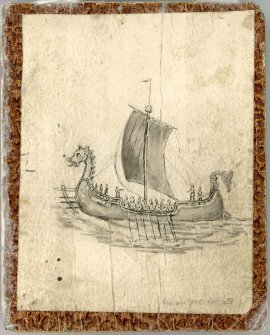 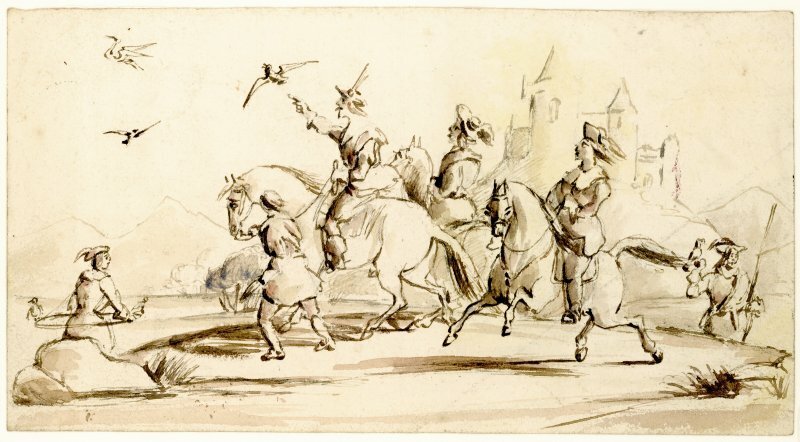 His interest in history led him to recreate imaginative scenes from Caithness' history, including sketches of the Norse settlers who occupied the area, and a group portrait of the family of John O' Groat. Nicolson was a prolific artist with a distinctive style, providing Caithness with a unique cultural legacy. 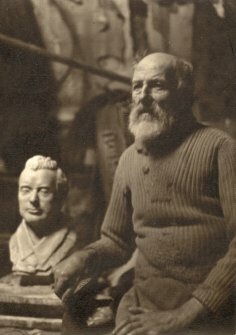 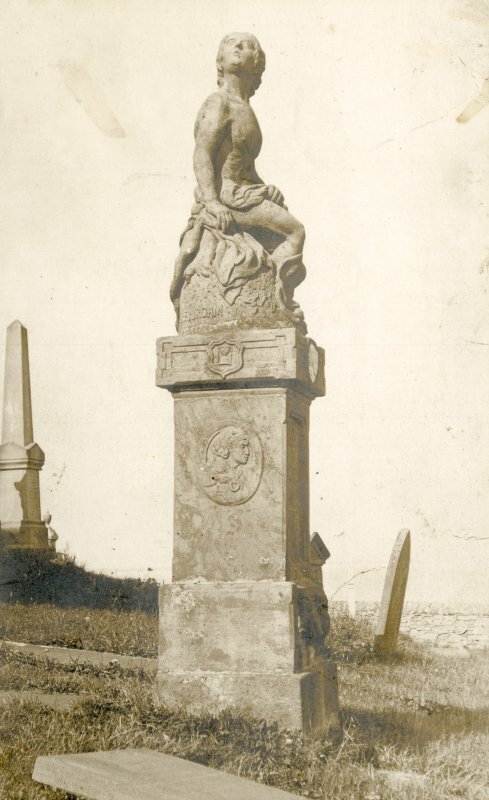 Nicolson was also a talented sculptor, executing sculptures of people as well as accepting commissions for monuments, including gravestones, of which numerous examples can be seen in Canisbay Churchyard. Nicolson's most iconic sculpture is perhaps 'Meryvn's Tower' at Nybster Broch, a monument created in commemoration of Sir Francis Tress Barry. Nicolson used the "spoil" from their excavation to provide building material for the monument which is situated on the promontory headland at Auckengill, north of Keiss, just meters along from the Nybster broch itself. 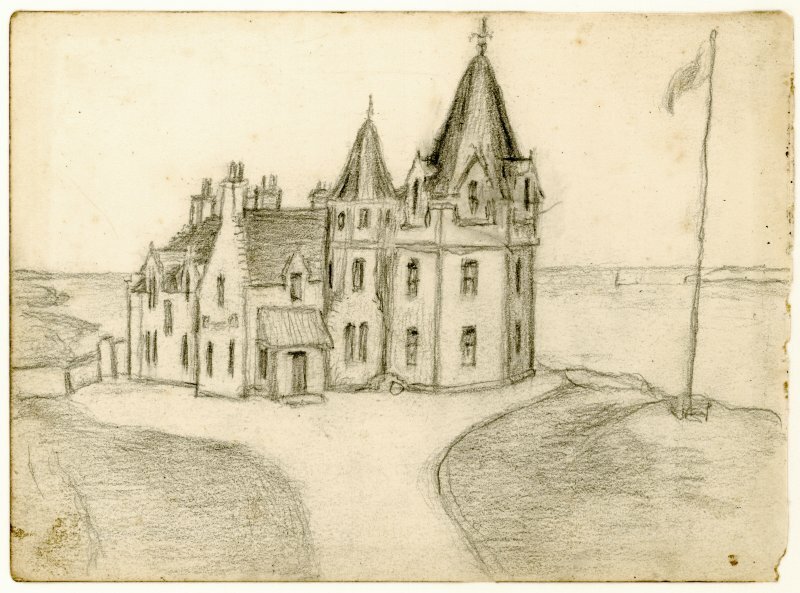 The collection was gifted to RCAHMS by Nicolson's grandson in 2005/6. 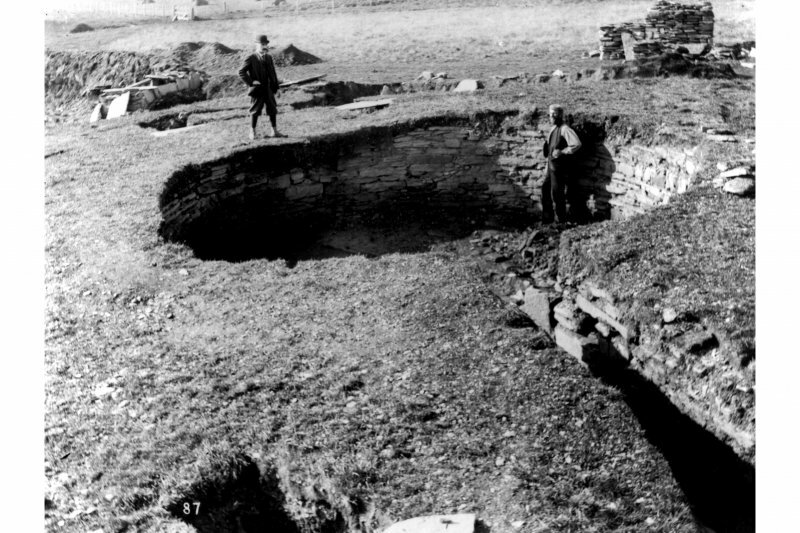 Excavation photograph - entrance passage and centre of broch during excavations. 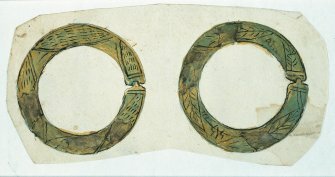 Originals (2 copies) stored in PRINT ROOM. 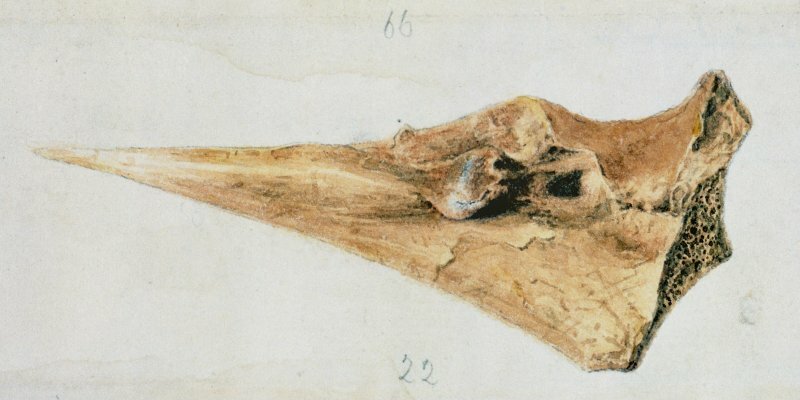 Scanned image of watercolour drawing showing skeleton. 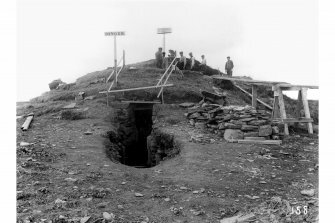 View of the excavations of ‘The Pap’, Hillhead, Caithness, by Sir Francis Tress Barry in 1901, showing the entrance from outside. 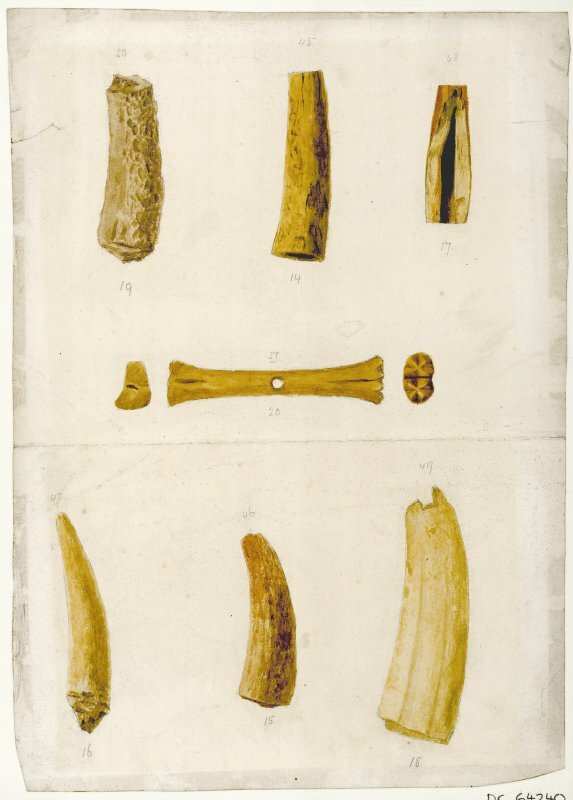 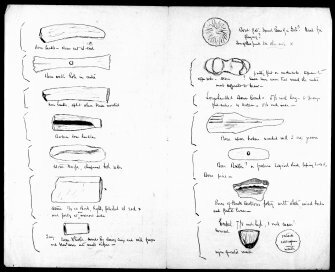 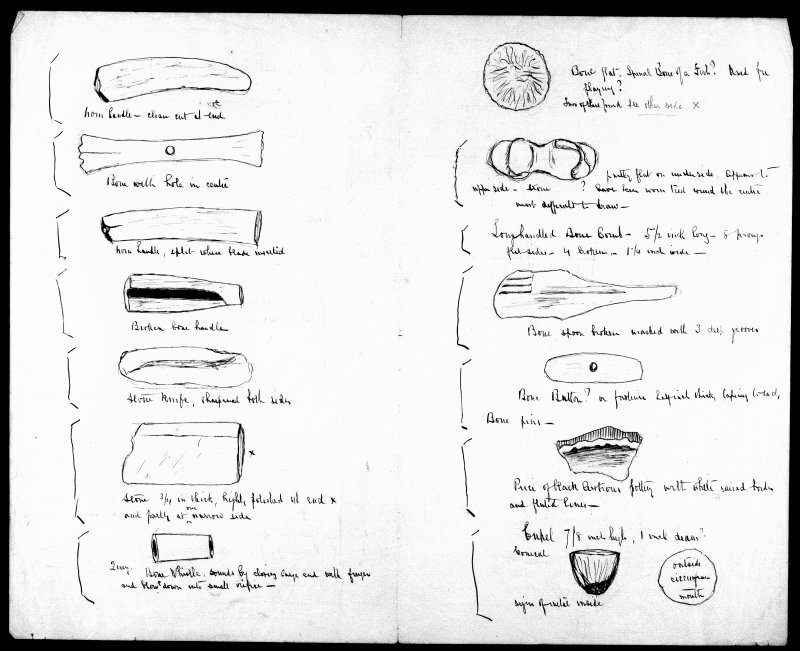 Scanned image of a drawing of six artefacts, of bone and stone. 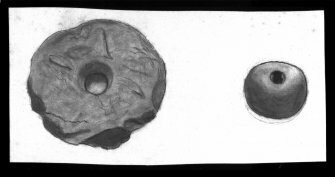 Scanned image of a drawing of a stone artefact viewed from three different perspectives. See also E 40893 for plan. 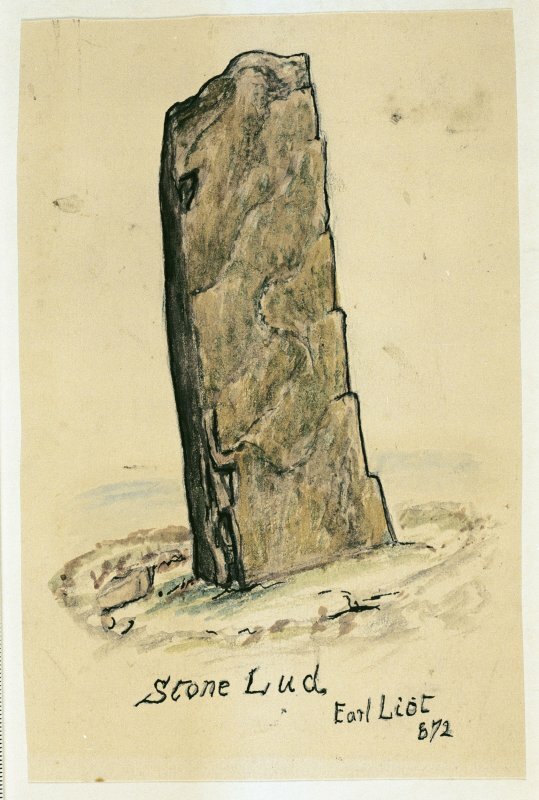 Scanned image of a drawing of a standing stone, entitled: 'Stone Lud. 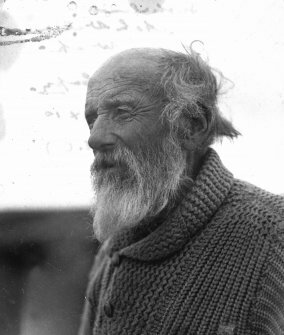 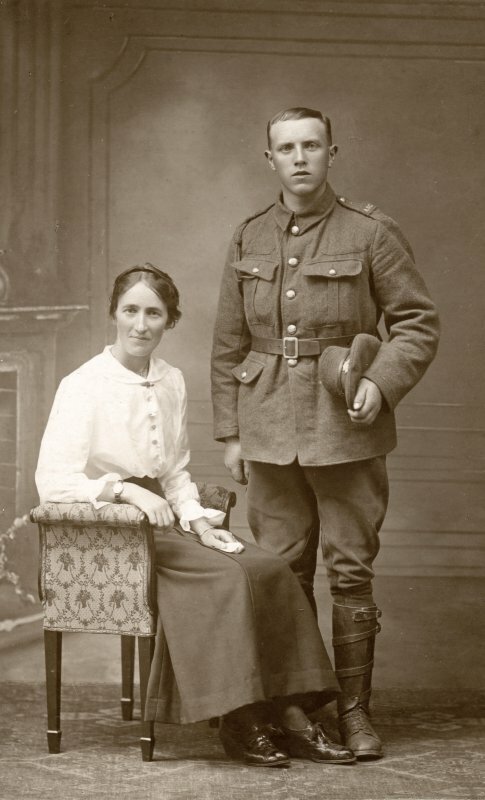 Earl Liot. 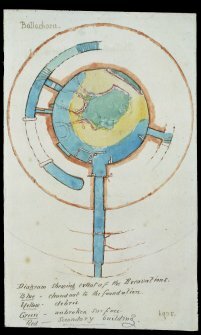 672'. 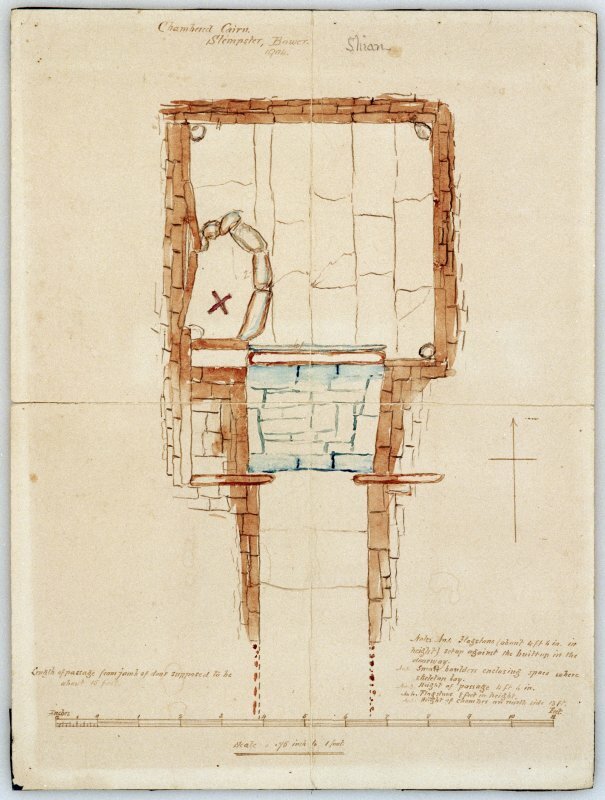 Scanned image of a drawing showing the excavation of a burial mound; annotated; dated 15-8-04. 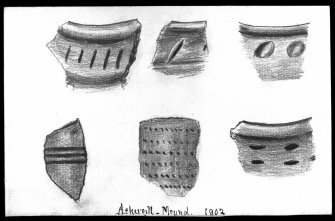 Scanned image of a drawing of assorted pottery sherds; entitled: 'Ackergill Mound, 1902'. 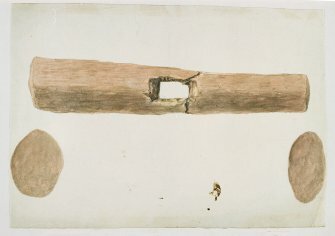 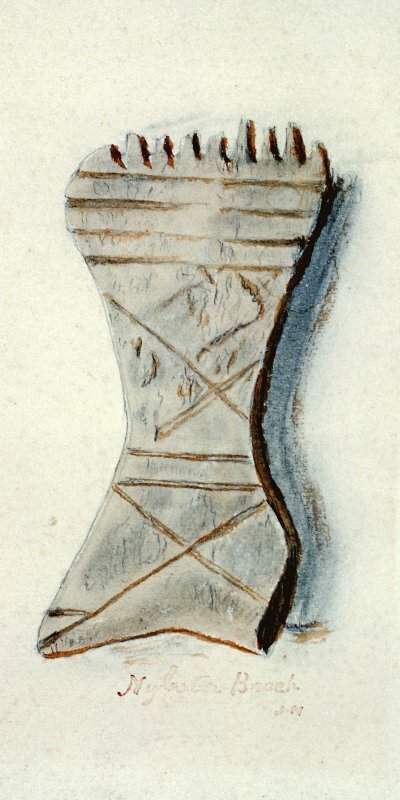 Watercolour of a wooden artefact with a slot in it. 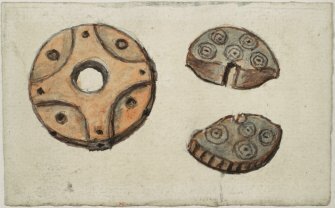 Scanned image of a drawing of two engraved discs or rings; possibly the obverse and reverse sides of the same object. The reverse side of the paper used for this drawing is signed J. Nicolson and dated 1903 [see PPD 37B]. 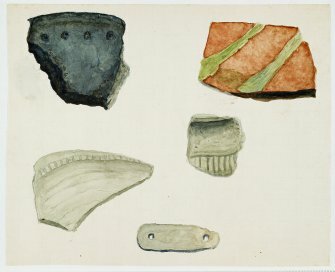 Watercolour of four pottery sherds and a piece of bone with two perforations. Watercolour of two artefacts: a slotted iron tool and a ring. Scanned image of a drawing of two spindle-whorls. 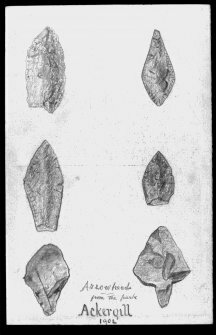 Scanned image of a drawing of six worked flints, titled: 'Arrowheads from the park Ackergill. 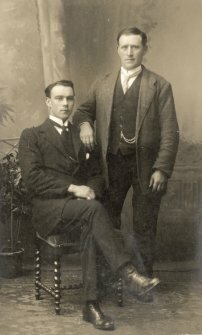 1902'. Digital copy of a drawing of a stone-built feature, titled: 'Ackergill Mound, 1902'. 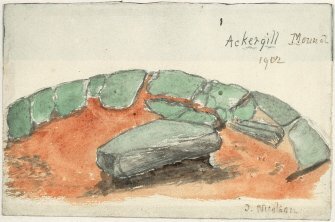 Verso: 'Ackergill Mound. Circle of Stones where skulls were found in debris'. 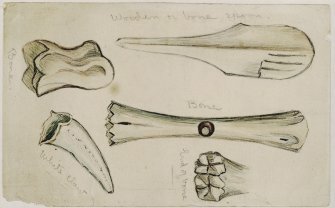 Drawing of five bone artefacts. 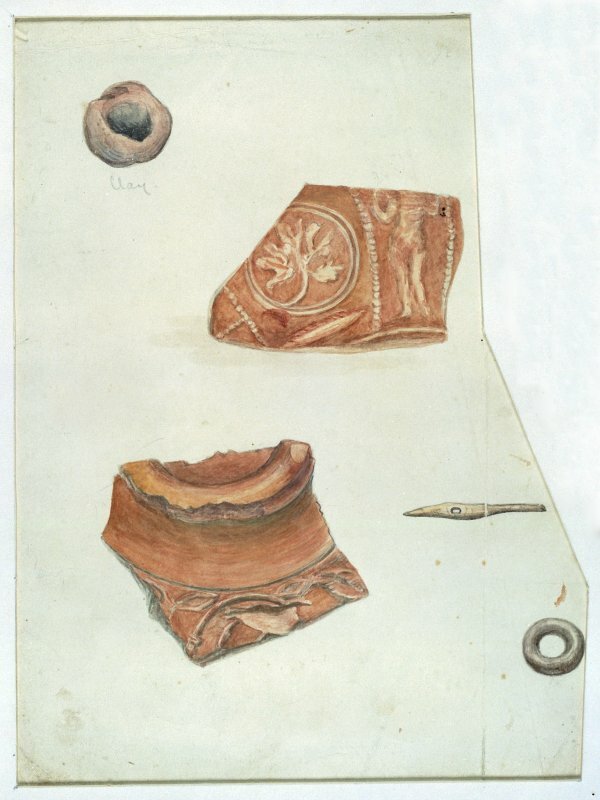 Drawing of three artefacts, highly elaborate in form and decoration; two of which are possibly part of the same object. 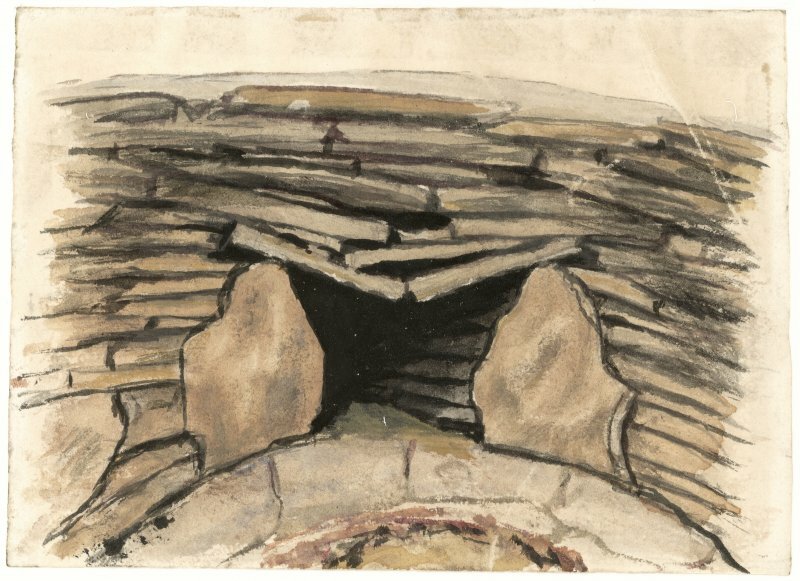 Scanned image of drawing of a vessel, entitled: 'Hillhead 1901, Stone Fire Place'. 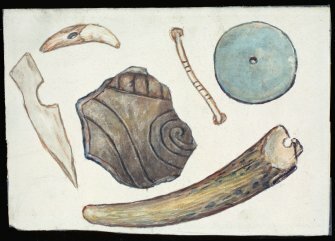 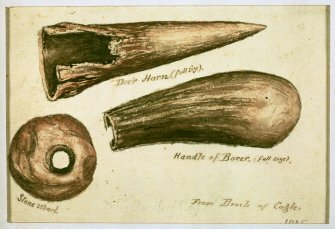 Scanned image of watercolour drawing of objects 'from Broch of Cogle, 1905' including a 'deer horn (full size)', a 'stone whorl' and a 'handle of borer (full size)'. 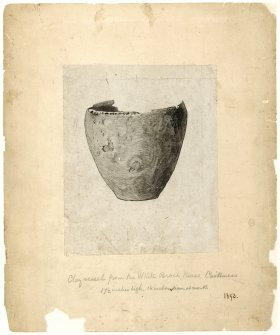 Annotated on reverse 'Cook'. Scanned image of a photograph of John Nicolson. Scanned image of a photograph of John Nicolson standing beside an example of his sculpture. 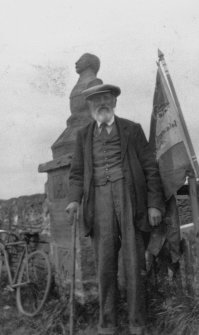 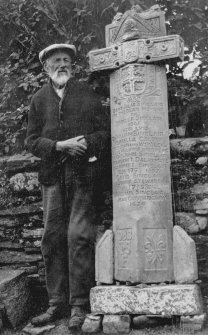 Scanned image of E 49352 - a photograph of John Nicolson at the Monument at Nybster. 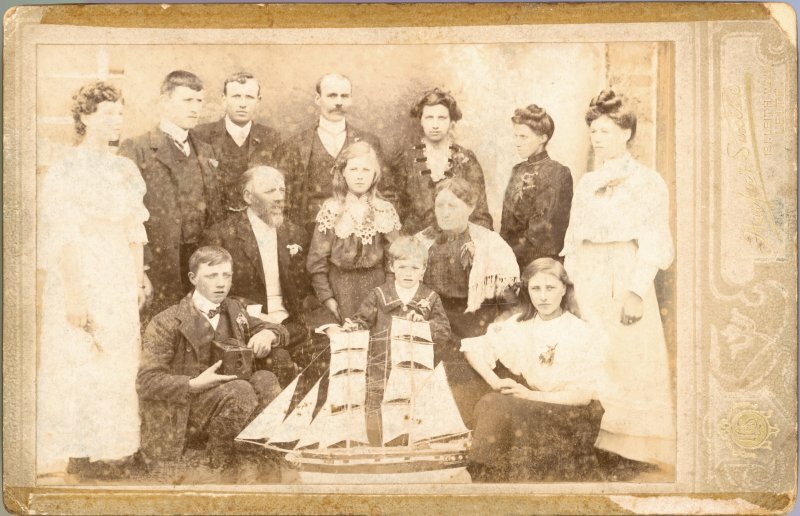 Scanned image of a photograph of John Nicolson and others, possibly at Nybster. 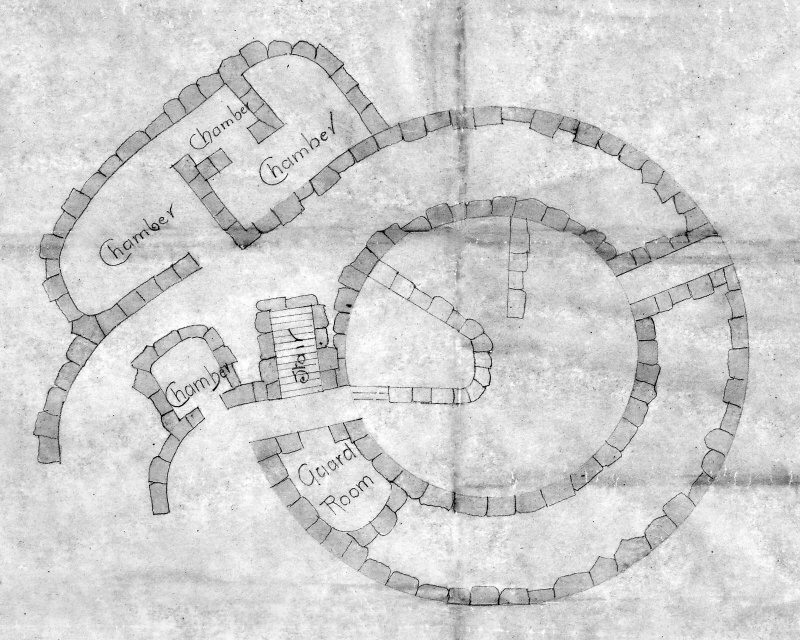 Scanned image of plan of broch. Annotated 'Ballacharn. 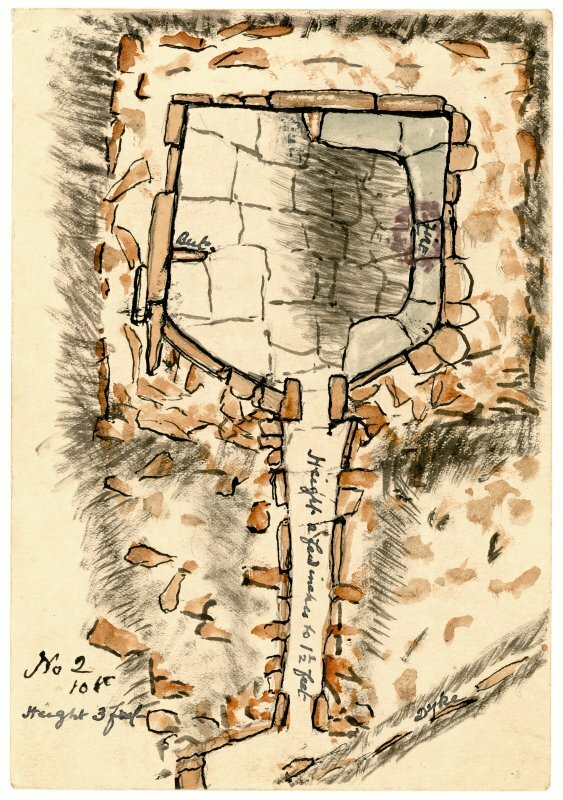 Diagram showing extent of the Excavations. 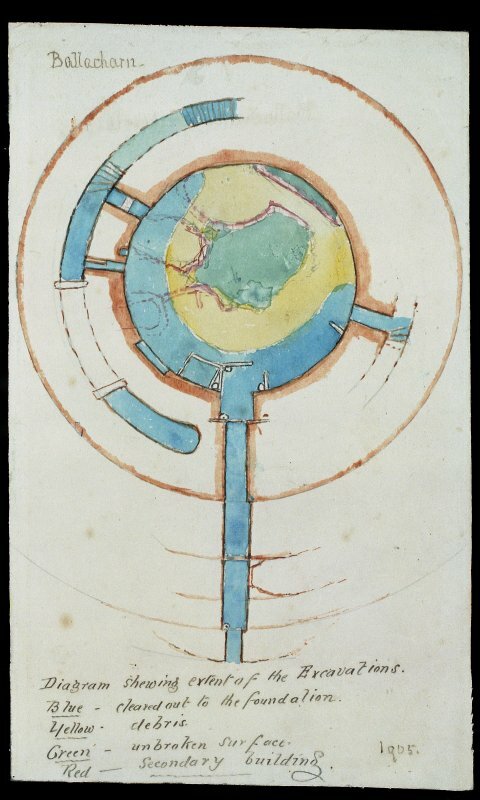 Blue - cleared out to the foundation. Yellow - debris. 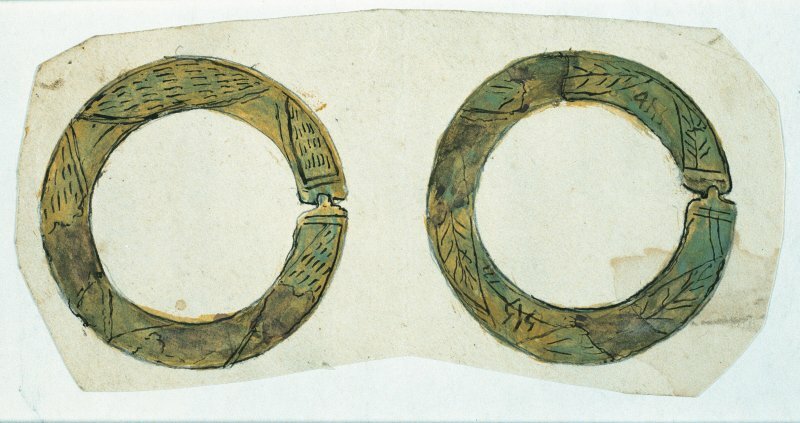 Green - unbroken surface. 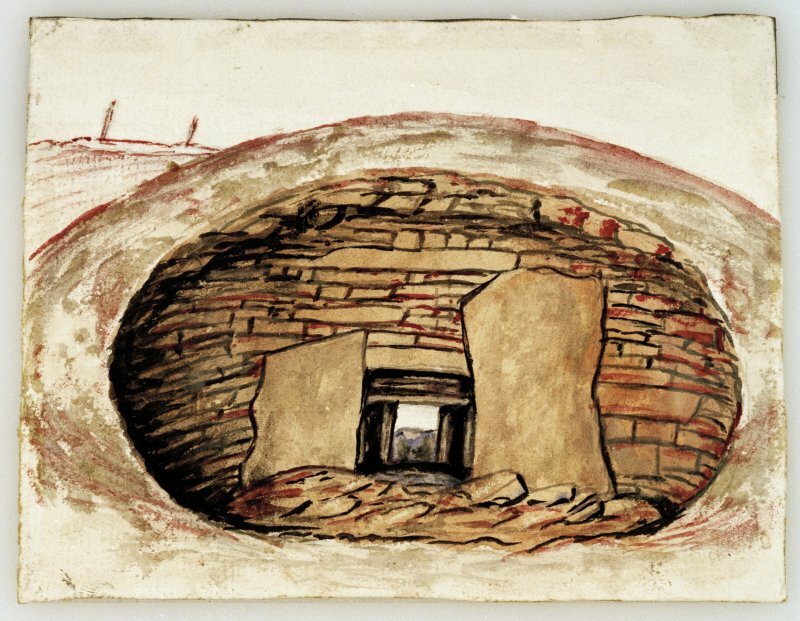 Red - secondary building. 1905'. 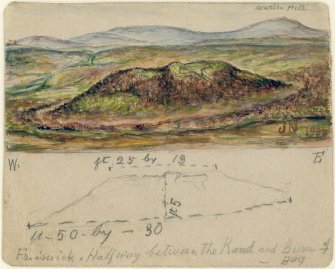 Annotated verso: 'Ballacharn, Acharole, 1905'. 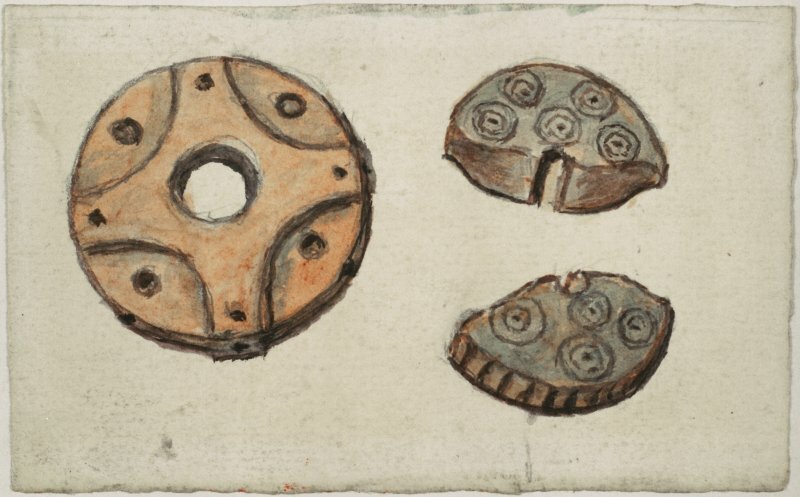 Scanned image of watercolour drawing of six objects including a a decorated piece of pottery and stone disc. 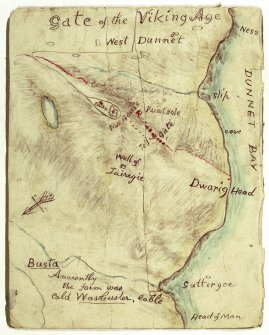 Annotated on reverse 'Ballacharn'. Scanned image of drawing of a stone-built chamber, entitled: 'Nybster Cremation'. 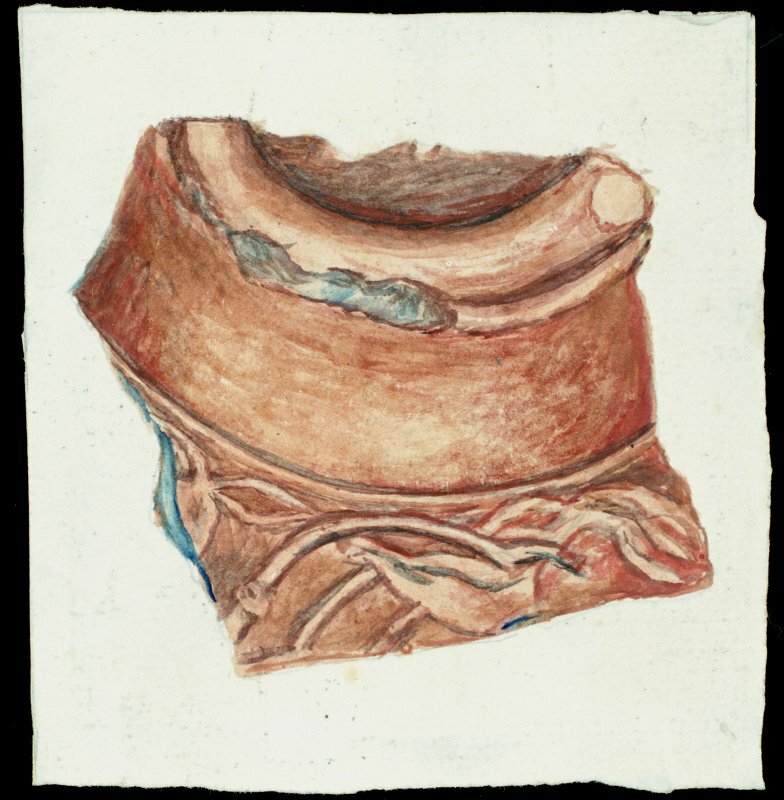 Scanned image of a watercolour of a base sherd of Roman Samian ware pottery. 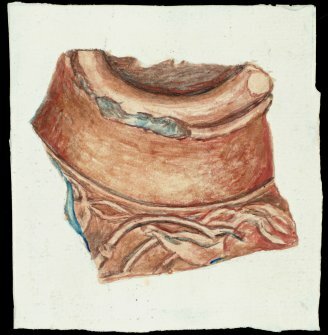 Scanned image of a watercolour drawing of a bone object recovered during Sir Francis Tress Barry's excavations at Keiss broch. 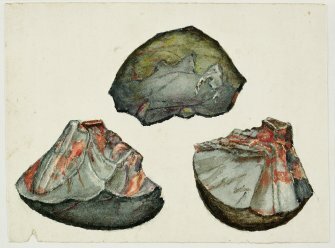 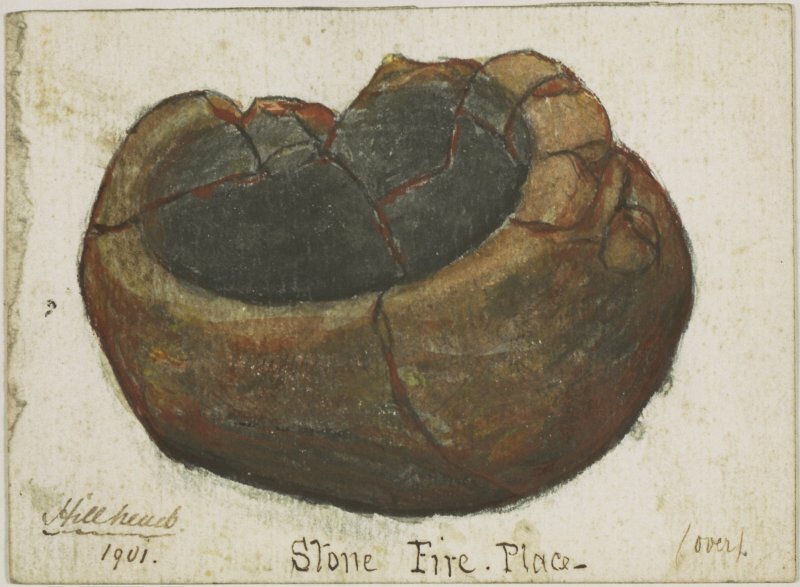 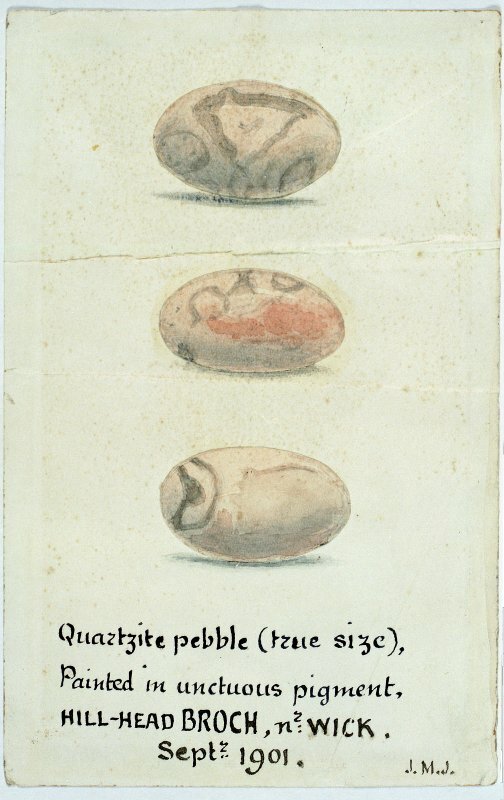 Scanned image of a watercolour drawing showing three views of a painted pebble from the excavations by Sir Francis Tress Barry at Hillhead broch, 1901. 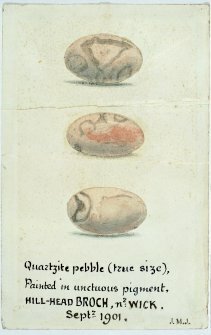 Titled: 'Quartzite pebble (true size), Painted in unctuous pigment, Hill-Head Broch, nr Wick. 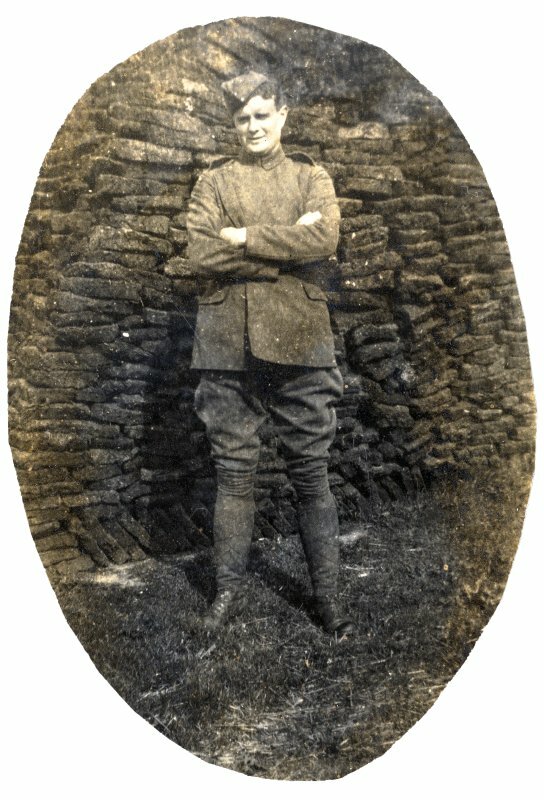 Sept 1901 J.M.J'. 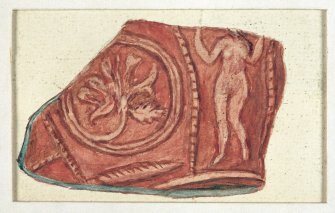 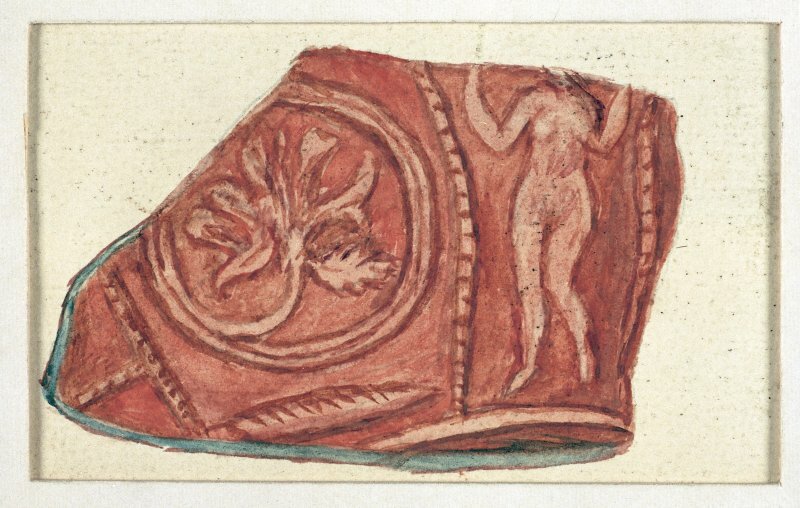 Scanned image of a watercolour of a sherd of Roman Samian ware pottery recovered during Sir Francis Tress Barry's excavations at Keiss broch. 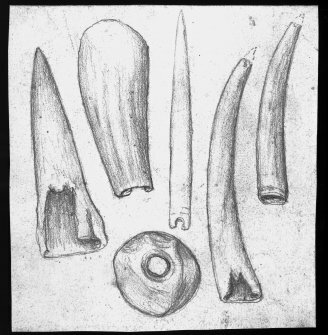 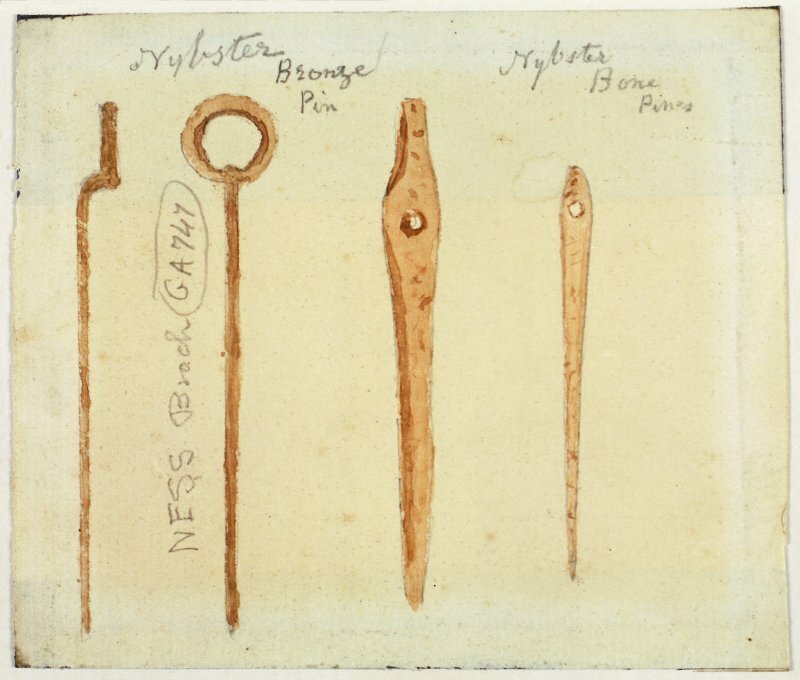 Scanned image of a drawing of bronze and bone pins from excavations by Sir Francis Tress Barry and John Nicolson at Nybster and Ness brochs. 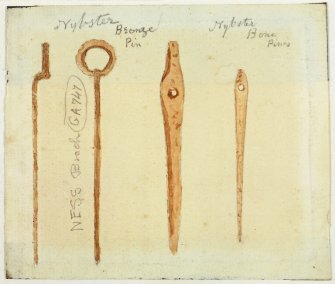 Bronze pin from Ness broch annotated with museum accession number 'GA747'. 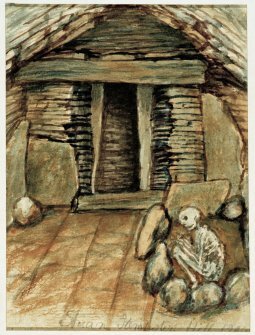 Provenance of bronze pin is given as Nybster broch but there is a contradictory note that attributes it to Ness. 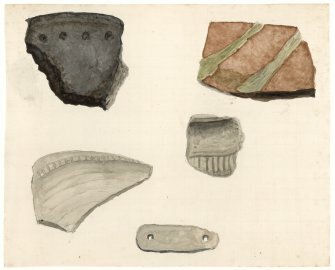 Scanned image of watercolour drawing illustrating an assortment of five artefacts, including two sherds of Samian ware from unidentified excavations by John Nicolson or Sir Francis Tress Barry..
Scanned image of a watercolour drawing of a weaving comb. 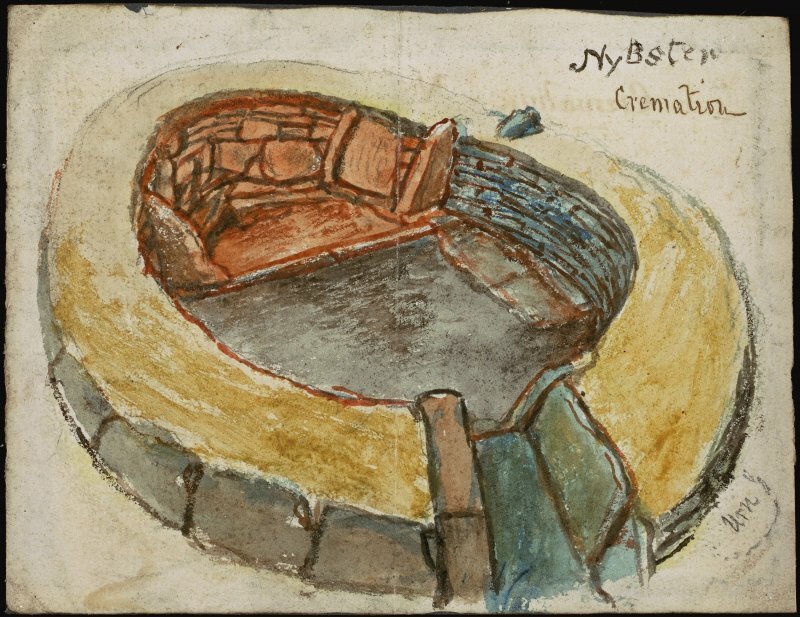 Annotated 'Nybster Broch. 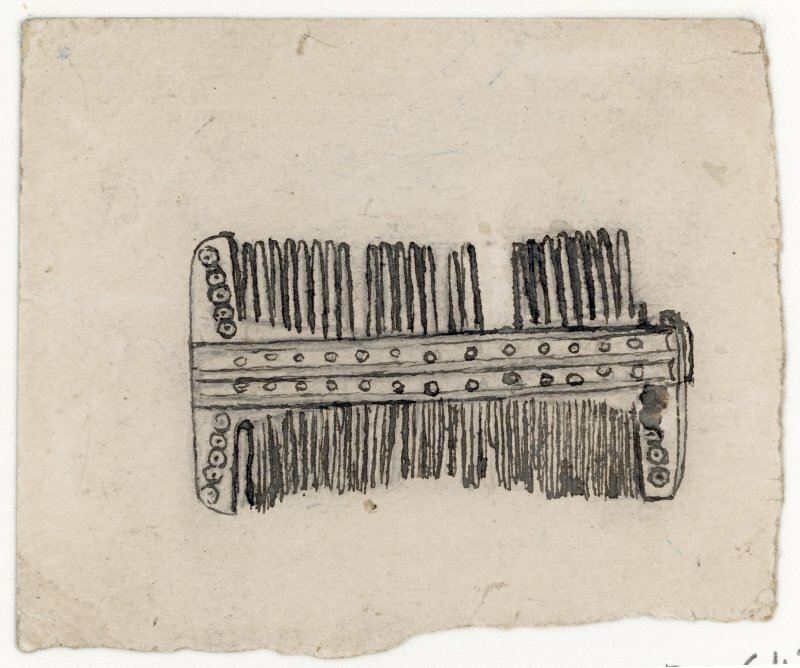 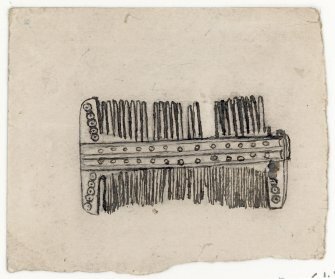 J N'.Watercolour of a weaving comb, entitled: 'Nybster Broch'. 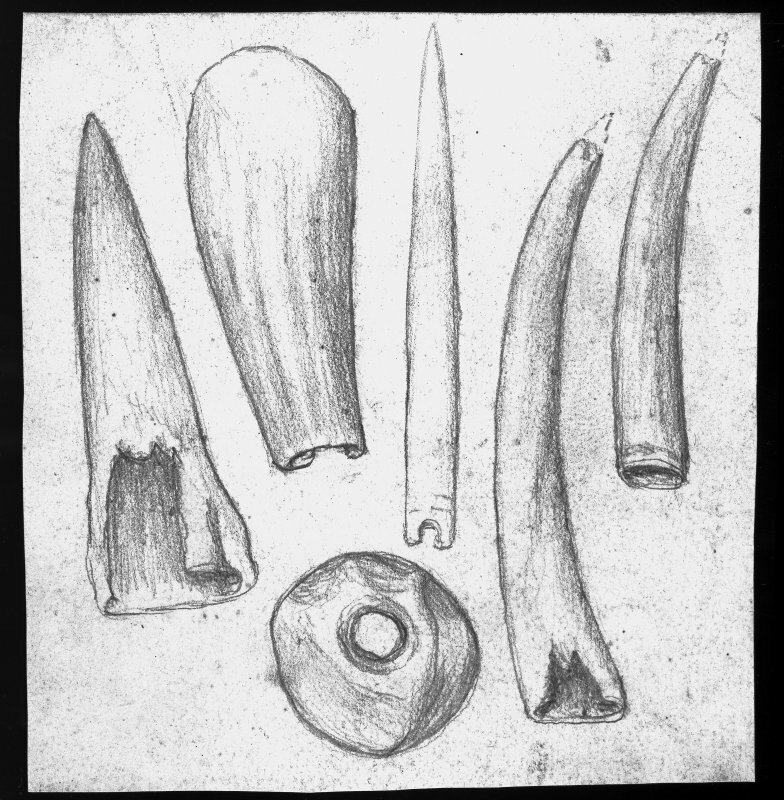 Scanned image of drawing of thirteen artefacts, primarily of bone or horn, but also of stone and ceramic; annotated with descriptions and in some cases, measurements. 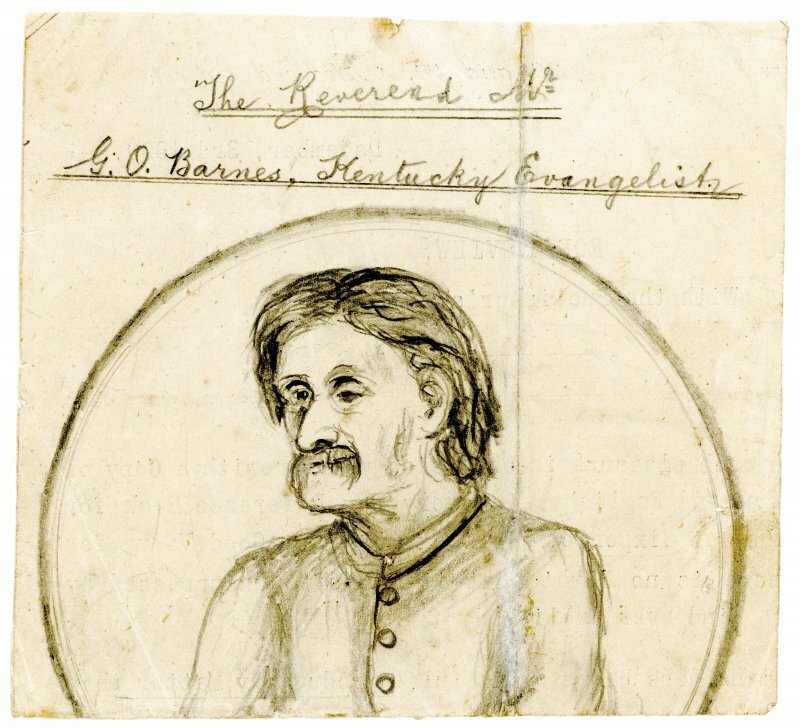 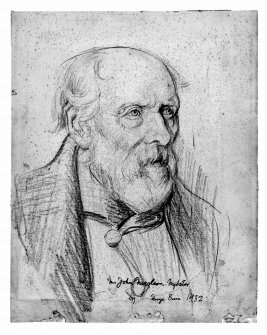 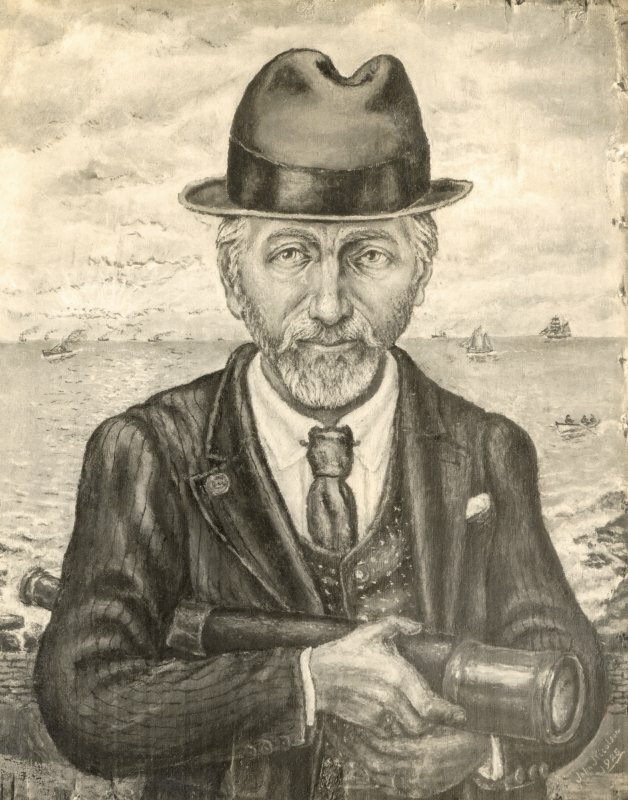 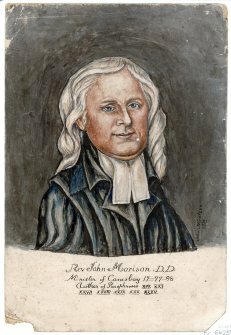 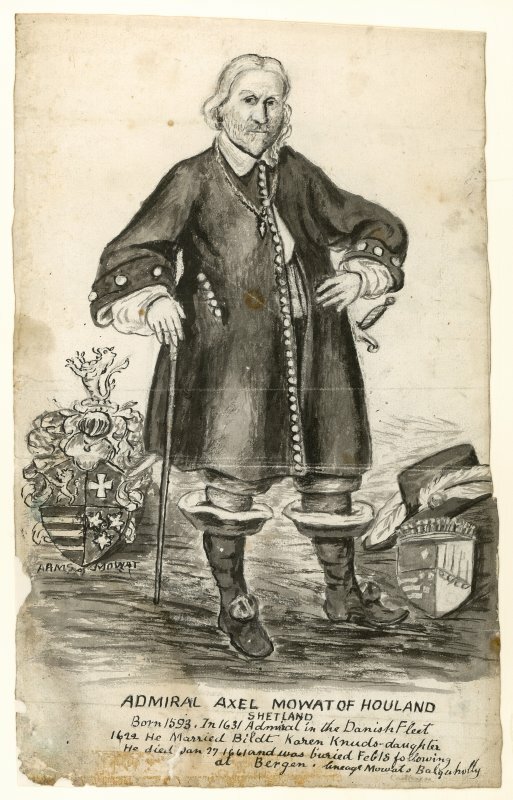 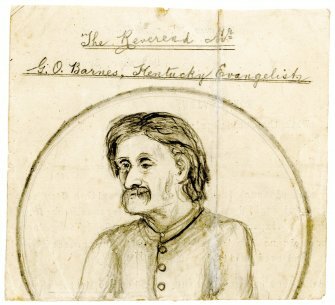 Scanned image of a drawing of John Nicolson, by George Bain. Photographic copy of a hand-drawn map of the Dunnet Bay area, Caithness, entitled 'Gate of the Viking Age'. 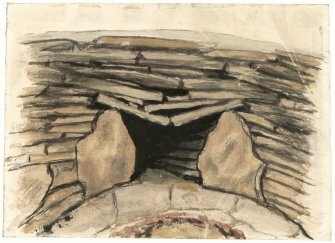 Watercolour drawing of McCole's Castle chambered cairn in 1907, showing chamber from back. 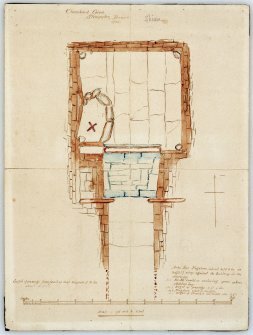 Scanned image of watercolour drawing showing ground plan of chamber. 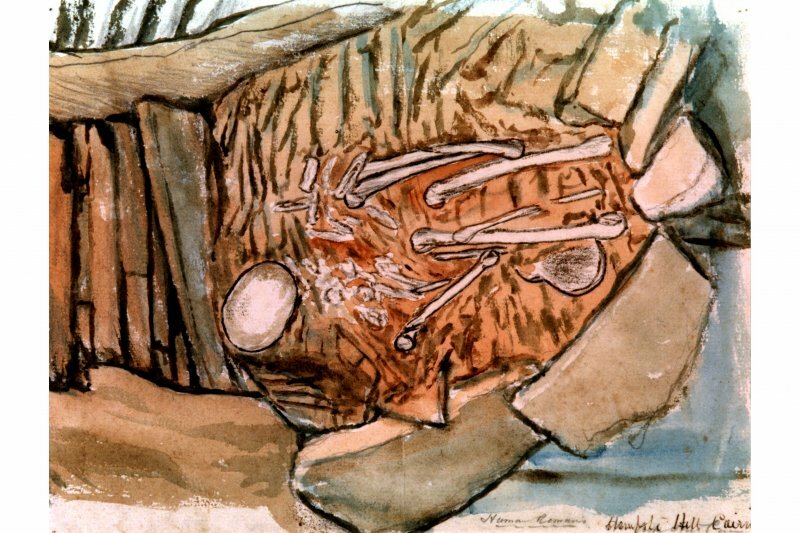 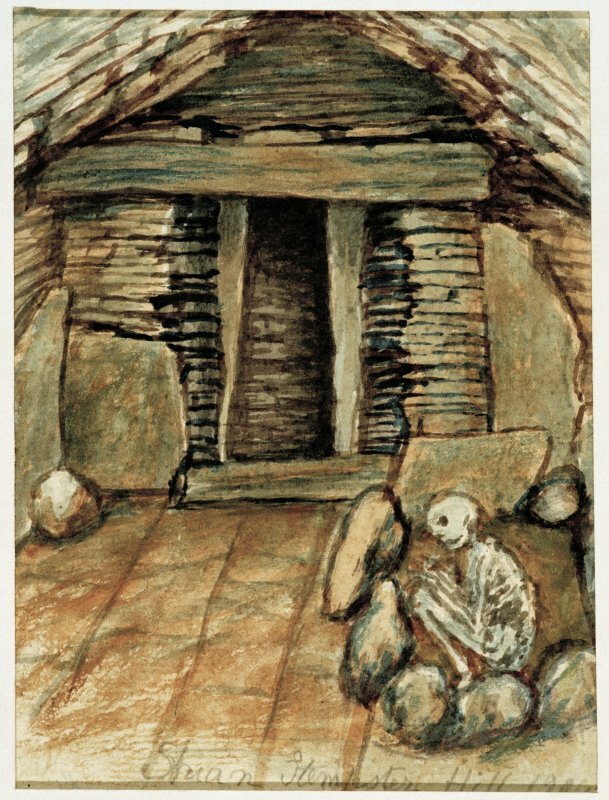 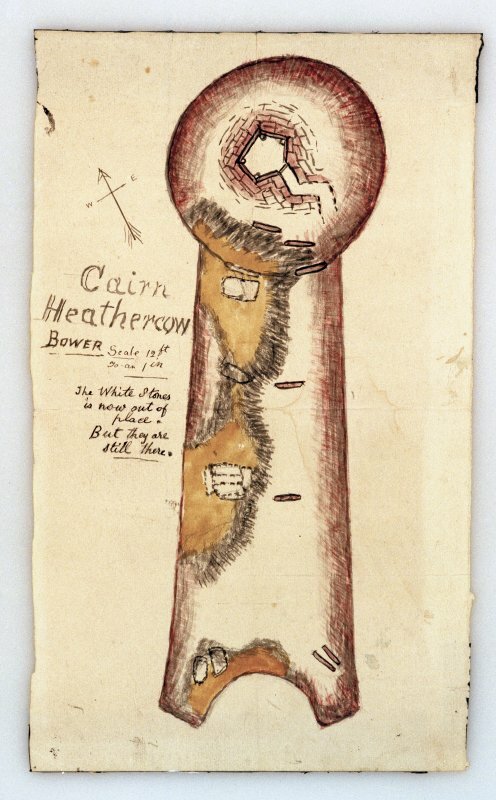 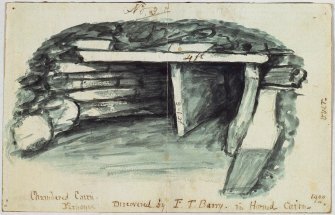 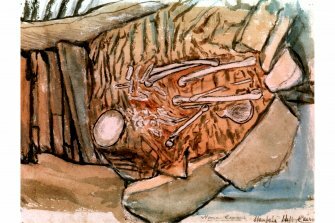 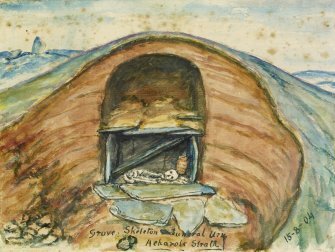 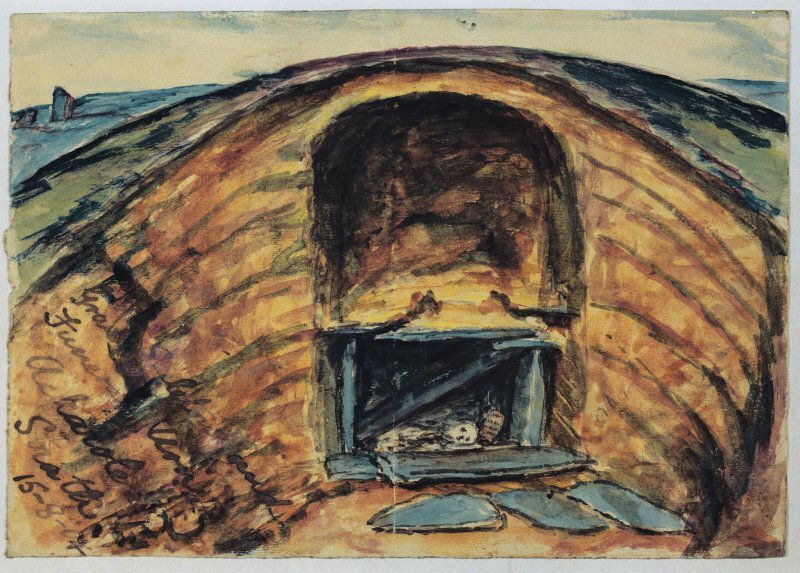 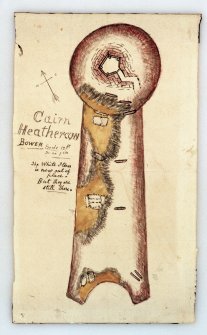 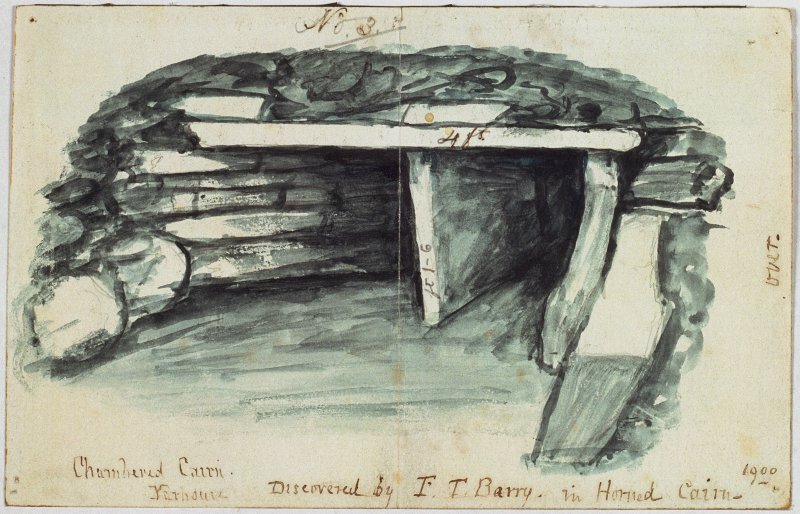 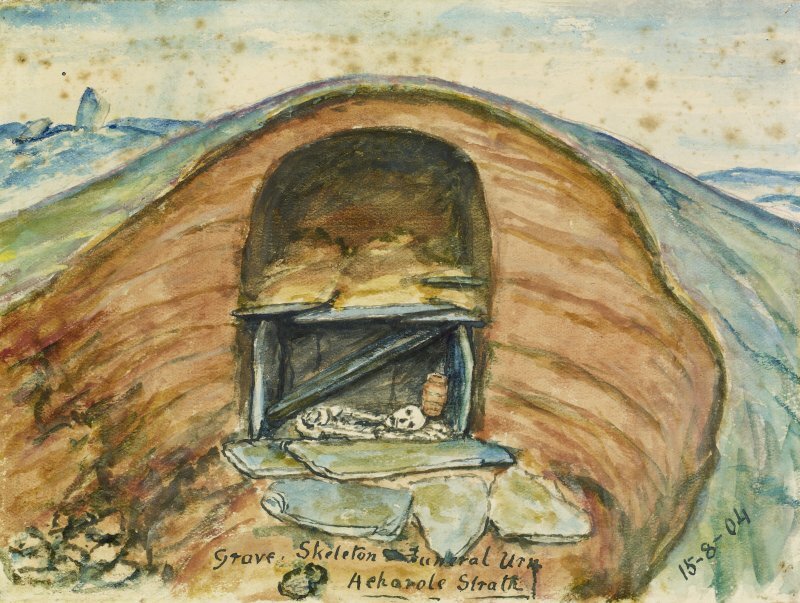 Scanned image of watercolour drawing of cairn interior showing chamber and burial. Drawing of beaker from cist, annotated with measurements. 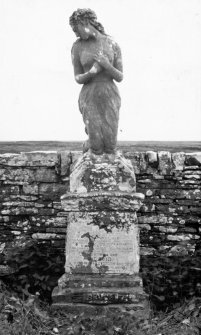 Labelled: 'Grave, Skeleton, Funeral Urn, Acharole, Strath, 15-8-04'. 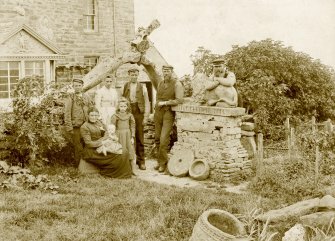 Scanned image of a photograph showing group of people with statue of lion and whalebone arch. 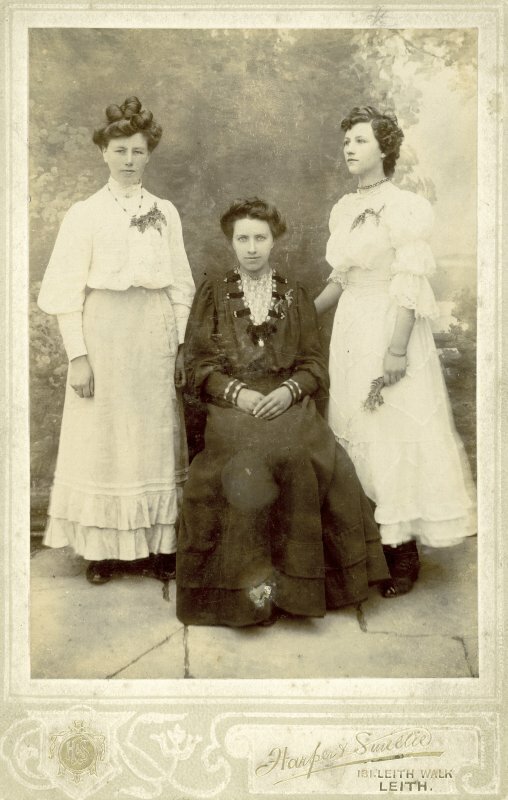 Scanned image of a photograph of the John Nicolson family taken by Harper & Smellie, 131 Leith Walk, Leith. 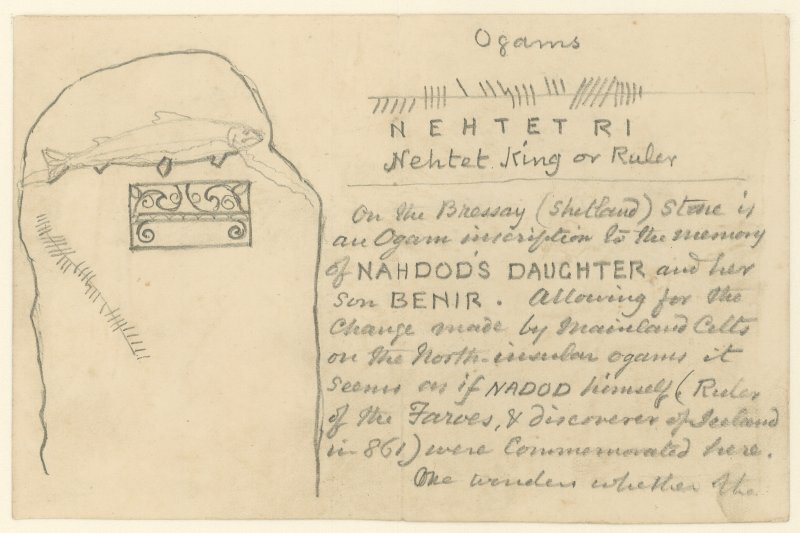 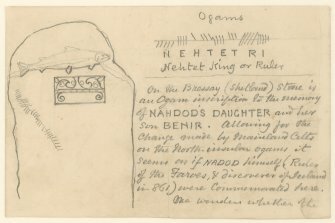 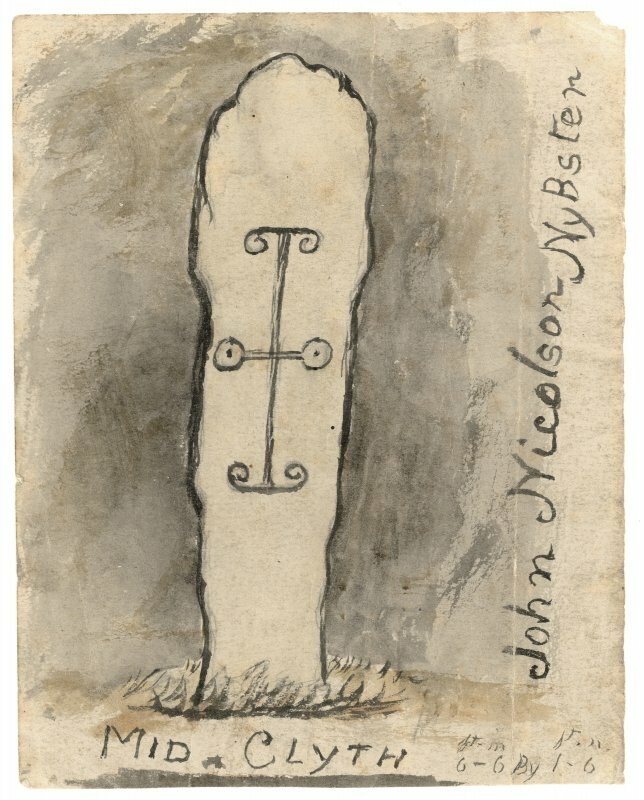 Drawing of a carved stone; annotated with measurements; entitled 'Mid Clyth'; and signed 'John Nicolson Nybster'. 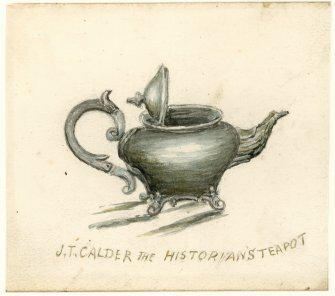 Drawing of teapot, annotated "J.T. Calder The Historian's Teapot"
Drawing of several artefacts, predominantly, if not exclusively, of bone.